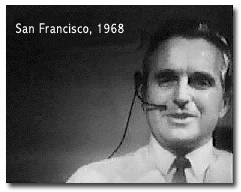 Demos captured over the years of the technological breakthroughs pioneered by Doug Engelbart and his research staff. (1964-1978) NLS was the system Doug and his team presented in their 1968 Demo. Here you see Doug and his team in a seminal moment in history. For background, see About NLS/Augment. Doug's 1968 debut of NLS (Augment's precursor) and his guiding principles, he gave this spectacular demo at the Fall Joint Computer Conference in San Francisco, while video teleconferenced with his team back home at his SRI lab in Menlo Park, CA. The technical title of this presentation is A Research Center for Augmenting the Human Intellect. Visit our Doug's 1968 Demo portal page at theDemo.org for more options and links, including an interactive chapterized version, an abridged version, plus more background, links, resources, press, and reflections on the demo from Doug and his team. Click here to experience the 1968 demo interactively. One year after the 1968 Demo, Doug and his team gave a repeat performance at the 32nd Annual Meeting of the American Society for Information Science (ASIS), October 1, 1969, San Francisco, CA. This demo/presentation was filmed on 3 reels: Playlist | Reel 1 | Reel 2 | Reel 3. Click here to experience the 1969 demo interactively. Kirk Kelley, former developer in Doug's SRI lab, demonstrates his own project adapting NLS to Stewart Brand's concept of a Whole Earth Catalog. This demo is hosted at the Stanford Library Special Collections MouseSite archives. (1978-1996) Augment was a commercialized version of NLS evolved by the team when it transferred from SRI to Tymshare, Inc. Augment served hundreds of customer organizations, and its development continued through 1984, when it transferred to the aerospace company McDonnell Douglas Corporation. Doug left MDC in 1988 to found the Bootstrap Institute with Christina (now the Doug Engelbart Institute), with rights to continue evolving Augment as a research prototype. 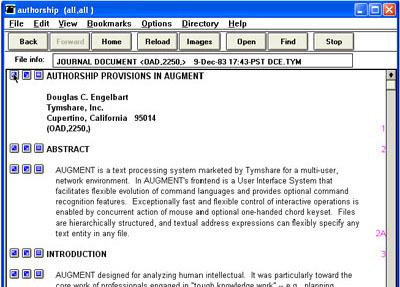 In the mid-1990s Doug and Christina were awarded a DARPA contract to create a modern windows GUI client for Augment called Visual AugTerm. For background, see About NLS/Augment. 1987 Doug - Doug Engelbart demonstrates Augment during his lecture at the 1987 Computer Systems Colloquium at Stanford University. Watch the demo portion of his lecture (link FFs to 29:10). See also Doug's slidedeck for the lecture portion of the video. Note the monitor is facing up toward the ceiling to accommodate the overhead camera - check it out. 1992 Doug - Doug Engelbart demonstrates Augment throughout his three-day management seminar March 24-26, 1992, including using Augment to display seminar materials such as schedules, attendee rosters, and key points. He kicks off the seminar in Session 1 in Augment reviewing the 3-Day Seminar Schedule, the Day 1 Schedule, the Binder TOC, Six Hypotheses of the course, and Attendees Roster. He switches to overheads for a brief Conceptual Overview of the course, and ends with onscreen review of the Basic Hypotheses. In Sesssion 2 he demonstrates how kids learn the 5-key keyset. Later he demos key concepts of the user interface with mouse and keyset. In Sesssion 7 @10:05 he gives a more extensive demo of key concepts presented in Section F. In Sesssion 8 @4:16 he demonstrates a case examples of fast, flexible browsing within a knowledge repository, and @1:27:08 shows what's up next in the Seminar. In Session 11 @5:02 he gives a heads up on the final group exercise, and @20:51 he revisits the work breakout assignment in detail. 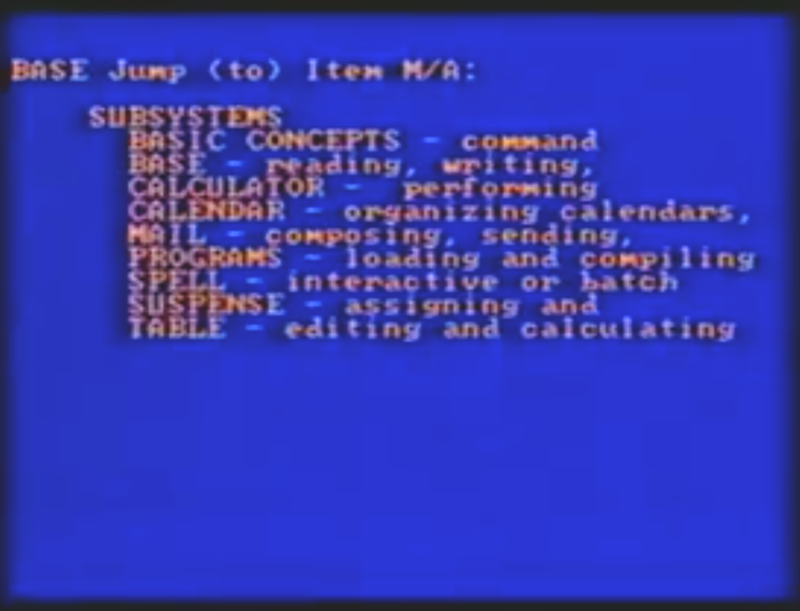 See the 1992 Bootstrap Seminar resources page for program, course binder, video and more. Christina's 2008 no frills demo of the Augment Browser, feature by feature, including Zoom buttons, Jump, Viewspecs, Filtering, Create Link, through the progressive user interface levels, from "Class 1" level up to some highlights of the Turbo level. This is a rough draft but informative production. See table of contents. Jim Norton, former member of Doug's SRI lab who later ran the ARC group at Tymshare, demonstrates the concept of a "project handbook" -- the browseable encapsulation of a project team's dynamically evolving knowledgebase. Jim shows how Augment-like funcitonality benefits a project team's ability to capture and leverage its evolving knowledge. By Brad Neuberg, lead developer on the HyperScope dev team using the old-style AugTerm client. See also Brad's writeup: The System Behind Engelbart's Historic Mother of All Demos. HyperScope was developed at the Institute in 2006 under a small NSF grant. For background, see About HyperScope. 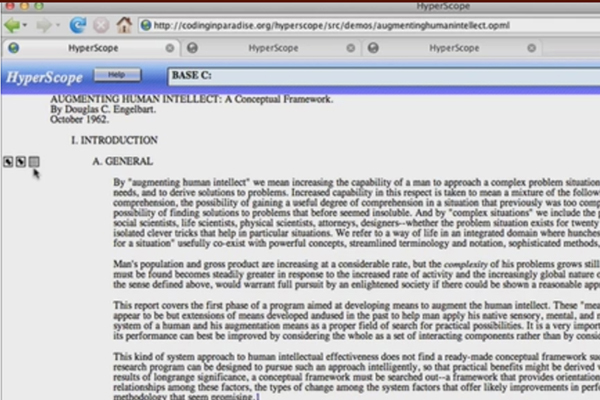 2013 Brad - Quick Tour of HyperScope (9 minute Screencast). By Brad Neuberg, lead developer on the HyperScope dev team. In this demo he is using the Turbo User UI via Firefox 2.0 browsing HyperScope enabled files (i.e. files tagged with HyperScope attributes). BONUS: Introductions. See also Brad's writeup: The System Behind Engelbart's Historic Mother of All Demos. 2006 Eugene - HyperScope v1.0 Launch Event (Parts 1-4).